Package your sensitive electronic devices to perfection in AmeriVacS' Clean Room compatible Reel and Tray Chamber Vacuum Sealer - the AVC-20. Throughout their journey, your valuable products will be assured of arriving in a safe, dry, and contaminant free environment. The AVC-20 will quickly and efficiently vacuum seal your products at touch of a button. By eliminating excess air, you will reduce space for more economical shipping costs, hold contents in place to prevent damage, and avoid any static generation. The AmeriVacS AVC-20 is ideal for trays, tape and reels, and many popular styles of shipping tubes. It produces clean, neat and highly reliable seals for perfect SMD vacuum packaging every time. Traditional "snorkel" vacuum sealers cause the moisture barrier bag to wrinkle, fold, and distort under vacuum pressure before sealing, possibly leaving small holes though which air can slowly pass and ruin the integrity of the vacuum seal. The AVC-20 eliminates this problem by creating the seal before the bag distorts. The AVC-20 achieves consistent vacuum pressure by allowing you to preset the level you require. The large 22" x 22" Vacuum Chamber will accommodate large products and with the optional seal bars installed inside, you can vacuum seal multiple packages at the same time. The AmeriVacS AVC-20 uses a Compressed Air-Driven Vacuum Pump so you do not have to worry about noise, vibration or heat generation. As opposed to other electromechanically driven vacuum sealers, our design prevents particle generation, oil contamination, and costly maintenance shut downs. Spare replacement parts and all connections and tubing are included for a quick and easy setup. The solution for any general application packaging program, the AVC is the ideal solution for valuable items to be protected from oxygen, moisture and static charge. The AVC is hand-assembled using top-grade materials and components. The AVC has a compressed air-driven vacuum pump, eliminating any concern regarding noise, vibration, magnetic fields, or heat generation. Unlike electromechanically driven vacuum sealers, our characteristic AmeriVacS design prevents particle generation and oil contamination that often leads to costly maintenance and downtime. Order the optional second seal bar and the AVC instantly doubles smaller package volume. 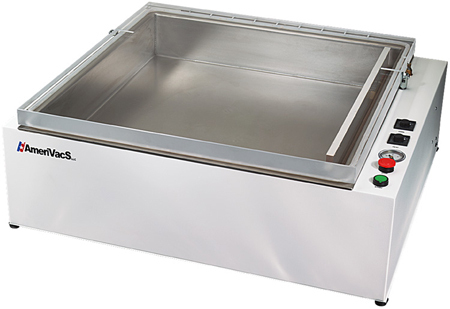 One button touch sealing, preset vacuum controls, and a large 22” x 22” x 4” stainless steel vacuum chamber best defines this no-nonsense workhorse. Available Upgrades: 220 Volt Conversion, Additional Seal Bar, Digital Temperature Control, Vacuum Selector Switch.